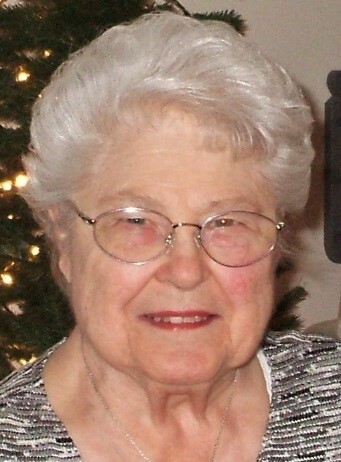 Rosalee Elaine Krueger, 92, of Butlerville, Indiana, passed away on Thursday, November 29, 2018, at Community Hospital South in Indianapolis, Indiana. A funeral service will be at 12:00 p.m. (noon) on Monday, December 3, 2018 at the Dove-Sharp & Rudicel Funeral Home and Cremation Service with viewing from 10:00 a.m. until time of service. Burial will be in the Vernon Cemetery in Vernon, Indiana. Rosalee was born on March 27, 1926, in Chicago, Illinois, to Willard E. And Roseneia A. (Klayer) Phelps. Rosalee married Robert C. Krueger on February 18, 1950, in Chicago, Illinois. Rosalee graduated from Lakeview High School and then attended the Illinois Masonic School of Nursing, graduating in May of 1947. She worked at Illinois Masonic Hospital, Heinz-Vaughn Veteran’s Hospital, and Northwest Hospital in Chicago before moving to Butlerville to care for her mother. She worked at Columbus Hospital from 1969 until her retirement in 1991. She always referred to the babies she delivered and cared for as “her babies.” Eventually, she delivered babies of those she previously helped bring in to this world. After retiring from her position at Columbus Hospital, she traveled with her aunt and mother. She was a member of the Otter Creek Baptist Church and Three Corners Home Economics Club. Rosalee was a loving and compassionate person. She loved to spend time with her family as well as friends. Everyone that knew her felt her love and zest for life and always knew they were cherished by her. Once you established a bond with her, you were part of her family. Left to honor her memory are daughter, Kristine (Kenneth) Beyers of Indianapolis; son, Robert E. Krueger, of Butlerville; grandson, Kent M. Beyers of Indianapolis; and many nieces; nephews; great-nieces; great nephews; and cousins. In lieu of flowers, memorial donations may be made to the Otter Creek Baptist Church, American Cancer Society, The American Heart Association, or Disabled American Veterans through the funeral home.